Today, I would like to introduce a tool that everyone who deals with SEO should be familiar with. It is not only an excellent analytical machine but also an invaluable help for positioners. RankRanger, because it is in question, even offers the possibility to build their tools into its reports. Looking at the website itself, one can see that the company takes a professional approach to its users, offering them interesting tools, analyses, and even plug-ins for the website. Within the Site Explorer area, although it is a Beta version, one will find quite interestingly presented keywords assigned to their website. This feature was offered by SEMrush, so I recommend comparing the results. What’s more, one can check the visibility of their subpages in SERPs and focus on those that potentially generate the most traffic. When we combine the above data with an analysis of competitors’ organic results, we get the full functionality offered by other SEO tools, such as Majestic or Ahrefs. Similarly, reports on paid search results are also well-presented. The function I expect in this type of tools is the preview of search results. If you don’t want to use the Google Diagnostic Tool manually, you can try RankRanger. related questions that can be created based on keywords. RankRanger is an excellent tool for those who create content on their blog. It helps to generate ideas for new keywords, answers to questions that one can put on their blog. RankRanger is an ideal solution for content marketing. 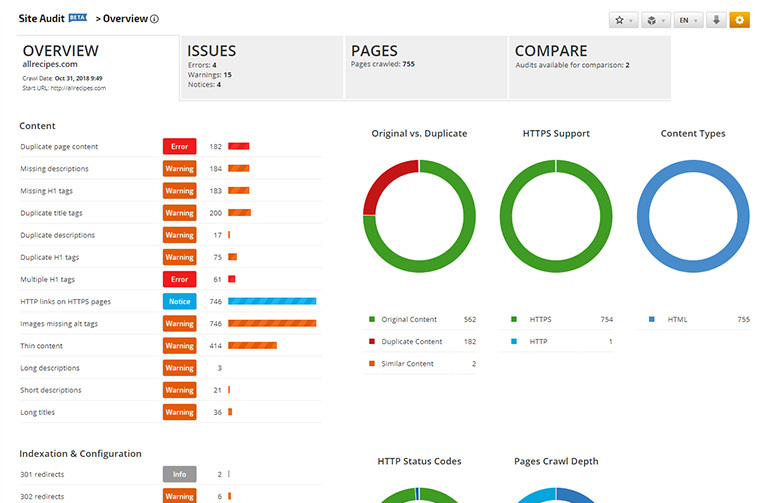 The tool analyzes the whole website efficiently. It reports the most common optimization errors, i.e., missing alternative descriptions, meta tags, headers, too short content on the site, etc. The technical analysis will provide one with a report on the redirections used. The cheapest RankRanger plan costs just $69 per month. It is recommended for small companies running up to 10 campaigns. Comparing this amount with the cheapest SEMrush plan, which is less than $100 per month, our application is a better, more affordable alternative to SEMrush. A New York-based company makes clear in its marketing message that Rankranger is a tool that one can implement into their solutions through the API. If you buy ten views (branded with your logo), you will pay 40 $ per month. Add to that plenty of integrations, thanks to which you will be able to integrate with Adobe Analytics, Ahrefs, Bing, Facebook, Instagram, Twitter, and YouTube, as well as many other solutions. The tool is worth recommending. If you want to see how RankRanger works, try the 30-day trial.